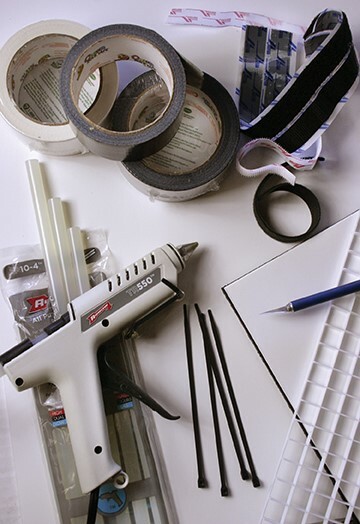 I’ve seen dozens of strange lighting setups over the years, where people cut corners and use whatever they had available or could afford)—from clamp-on desk lamps to standing work lights and fluorescent light fixtures designed for a garage or workshop. Sure, you may be able to get away with some of these crude basics, especially with today’s digital cameras that let you set the white balance to adjust for off-color temperature lighting. 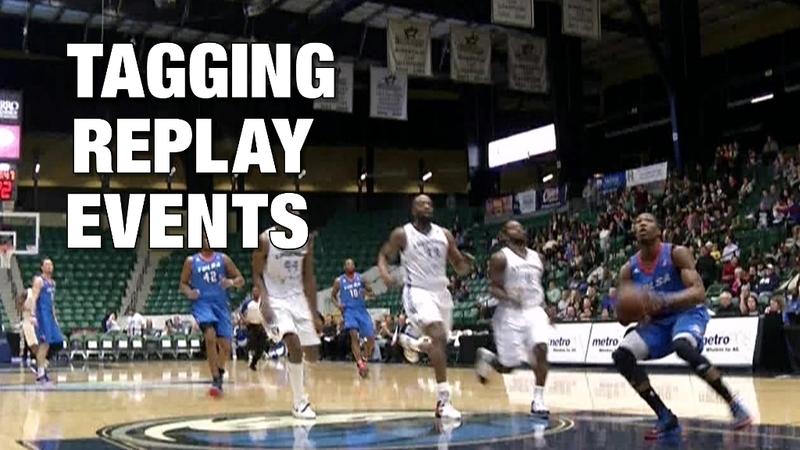 But when it comes to shooting green screen, the fewer corners you cut, the better. That still doesn’t mean that you have to buy or rent expensive lighting gear to get a good, useable result. I was inspired at a conference by colleague Victor Milt , who makes homemade light kits from simple materials. You can easily build one of these soft-boxes for less than $100 worth of materials – including white and black foam core, duct tape, hot glue, light sockets, lamp cord, plastic light grid material and Velcro. The compact fluorescent bulbs will cost you a bit more, depending on the quality you use, but this is by far the best alternative to professional studio lighting that I’ve seen to date. If you take your time and build it correctly, it will look as professional as well. 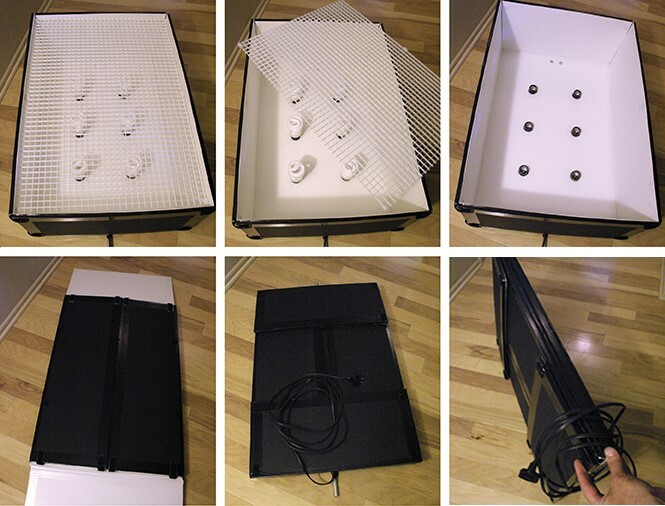 This professional-quality soft box light can be made into your own configuration, size, and scale using simple tools. As you can see in this image, the plug-in dimmer is an option I chose to control my lights, but it only works with the more expensive dimmable bulbs. You can’t find these easily at the hardware store, so if you want optimum color temperatures that are closest to daylight (such as the 5100K dimmable bulbs I used here), you’ll have to find a professional online lighting source. I got mine at www.BuyLighting.com and spent about $18 per bulb. At 75-watt light output per bulb, giving me a 450-watt output fixture, that’s still a very reasonable price when you consider the alternative of having to buy expensive cool-lighting fixtures and tubes like Kino Flos, or renting lights for a single day. You can also use bulbs from the hardware store, but mind the color temperature of the bulb—most are very warm, because they try to simulate incandescent bulbs for use in the home. You should aim for daylight or as close to 6000k-6500k as possible, but be sure all your bulbs match color temperature! You can also unscrew a couple of bulbs to diminish the light output of your fixture as needed, if you choose not to use the more expensive dimmable bulbs. I built one of these lights from Victor’s instructions and added a few variations of my own as I went along. I used white duct tape on the inside surfaces to give the light a clean, professional look while maximizing the reflective white space. I also used more hot glue and Velcro than the original plan called for, because I wanted a sturdy and durable design. I used more black duct tape over the heavily glued tabs shown here, to make the light look better and be more durable. In this image, you’ll notice the pole attached to the back of the foamcore lightbox, per Victor’s instructions to allow you to secure it with clamps vertically to a stand or suspended from a boom extension. You can also glue or Velcro a sheet of Mylar or frosted white film over the grid to get a softer, more even light, or drape a piece of white silk over the light box for a soft effect. The lights can be on for hours and still stay cool, which is a big advantage over the old-style hot lamps still used in many studios today. 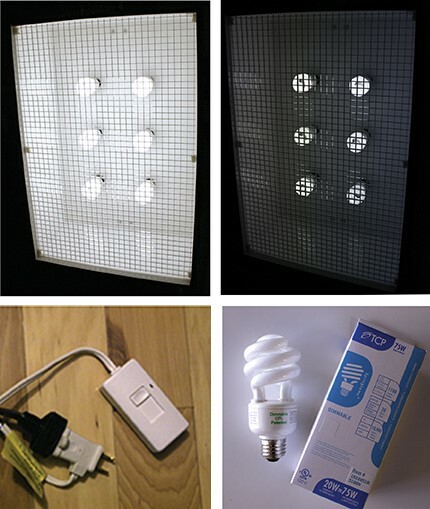 The light can easily be collapsed for transport or storage - the screen comes out; then, you remove the bulbs and put them back in their original boxes for safekeeping. You remove the Velcro tabs, collapse the sides of the box, and fasten them together with Velcro tabs. 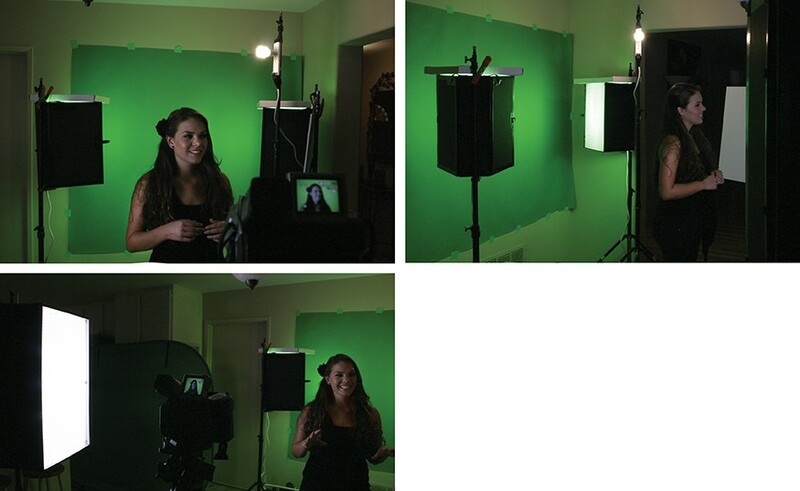 I also used this simple concept to build some smaller, more compact fixtures for lighting my green screen backdrops. 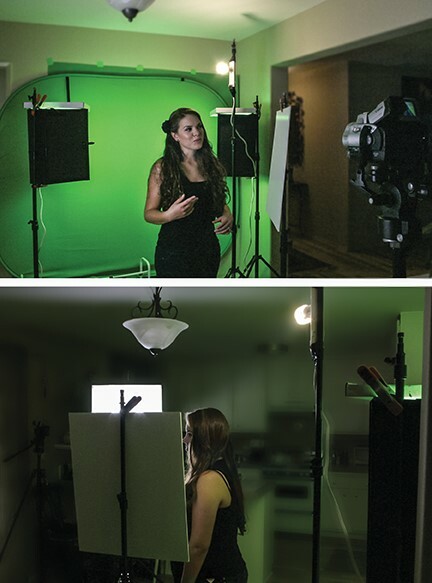 By using some simple components from the hardware store and some green fluorescent bulbs to enhance my green screen backdrop (and use much less light to get the coverage I needed), I was able to put together light fixtures for less than $20 each. To get “greener greens” that will key better in your compositing software on a portable background or green photo paper, you can also use green compact fluorescent bulbs. Below, you can see that I started with a couple of the green fluorescent bulbs screwed into a T and then attached to a socket plug. I put two of these into a power strip that I glued to the inside of the fixture. Because each of these bulbs draws only 24 watts (but has a 100-watt output), there is no danger of overloading the power strip: you’re getting about 400 watts of light with less than a 100-watt draw. These lights burn cool for hours. You can simply clamp these mini-fixtures to any stand and move them around as needed. You can also stack them vertically or attach them over each other on a stand to get a fuller light coverage. 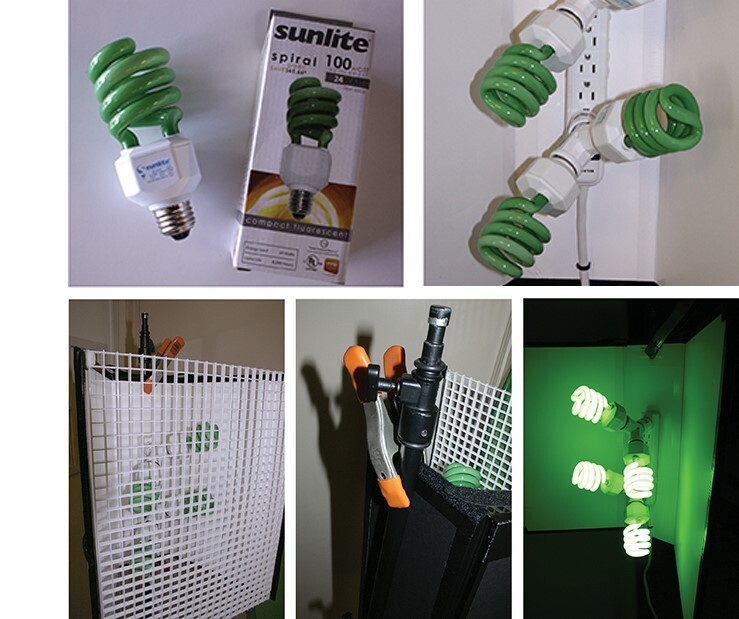 The compact fluorescent bulbs can be placed on a power strip and clamped or gaff-taped to a stand to use as a hair light as well as shown below. Here, we used green photo paper with the green bulbs to get a really decent and even light for our model in a small space in our home office. 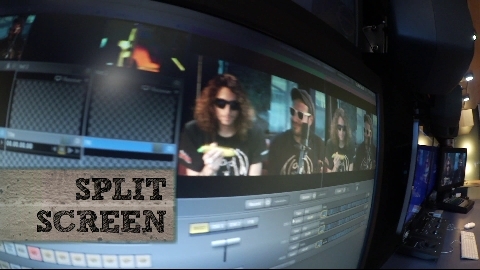 The end result was a decent green screen we could pull a good matte from. You can find information on virtual sets here.